So another one bites the dust. Although it never even made it into existence, for the last day or so I've been mourning the premature death of the Fort York Pedestrian and Cyclist Bridge, the plans for which were unexpectedly — but maybe not that unexpectedly — nixed by the Public Works Committee on Tuesday night. Although Councillour David Shiner was the face of the execution, a number of City Hall insiders have speculated that the decision to cut funding came from the top. The reasoning for the axe-job is straightforward, if dissatisfying. Even though there's funding in place for the bridge, the argument Shiner regurgitated is that $23 million is too much money for a city facing a significant budgetary shortfall in 2012. "You want to connect the people there, but at what cost? I have a lot of concern that we're so financially tight — just think about what that $23 million could do for bridge rehab, for road repair... I think it's important to have a sober second look at this, and that's all I'm trying to do." To hear local Councillor Mike Layton and Gary Welsh, the City's general manager of transportation services, tell it, however, this "sober second look" is bound to delay any pedestrian/cyclist connection in the area for three to four years or the kill the project entirely. Because Metrolinx had offered a limited window of time for construction over the GO tracks "any change in design or scope of this project would mean that probably the earliest you could get a bridge in there is 2015, 2016," Welsh told the Globe. Despite what might seem like common sense reasoning, it's most frustrating that the aesthetic qualities of the bridge are cited as a reason to categorize it as a frivolous expenditure. "I know that this bridge is almost like a piece of public artwork the way it spans across there, but I don't believe it is something that I can support" given the price," Shiner said. Better to spend half of that amount on an anonymous structure that'll have no visual impact, do little to inspire private sector investment in the vicinity, and that'll attract few tourists and out-of-area cyclists, so the argument goes. Forgetting the fact that over a million bucks have already been spent on the development of the bridge, it's difficult to call this decision anything but misconstrued and short-sighted. I think we need to ask ourselves what kind of city we want. The financial pressures Shiner speaks of are real, but it's necessary to underscore that Fort York Bridge has already been budgeted for, and the amount that it's gone over was expected to be covered by the City's Bridge Rehabilitation Fund. Is it really worth killing what would be a marquee addition to the city's waterfront area so as to be able to increase road repairs? 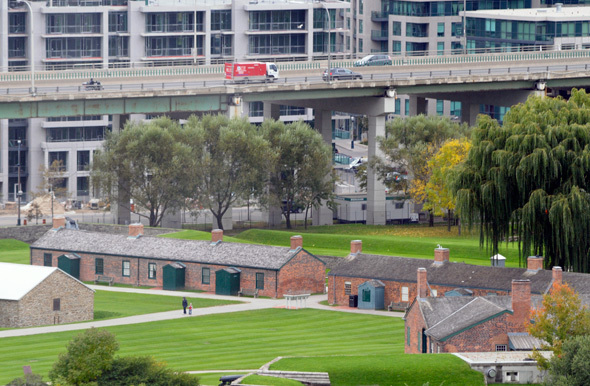 Fort York, lest we forget, is the cradle of Toronto. And for a city that's had a troubled relationship with its past, the loss of this bridge represents yet another blow. But along with the promise of putting our origins back in the public spotlight, the bridge was to be a crucial link the bikeway network and to add an impressive bit of architecture to an area that could desperately use it. In that sense, its loss might prove an even deeper blow to our future. For those interested, a local group has set up a Facebook page and petition to help save the Fort York Pedestrian-Cycle Bridge.